About two years after it started installing fiber optic cables to provide high-speed internet on an open access system, the Roanoke Valley Broadband Authority has its own office space. That follows a ribbon cutting on South Jefferson Street this morning. 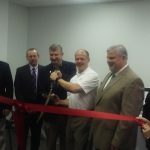 Singled out before the ribbon cutting was ABS Technologies, a private internet company that will provide service to the new Boxley Apartments downtown, by connecting the “last mile” from the Broadband’s fiber optic lines. Board chairman Kevin Boggess said everything seems to be on track.